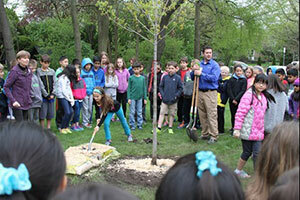 To celebrate Arbor Day, Davey Tree employees planted trees in their local communities. Their efforts resulted in the planting of more than 5,750 trees. Over the next 50 years, each one of those newly planted trees can generate $31,250 worth of air pollution control, recycle $37,500 worth of water and control $31,500 worth of soil erosion, according to the Arbor Day Foundation. To promote the many benefits of trees nationally, Davey ran a #pics4trees campaign on social media. For every photo with the #pics4trees, Davey donated $1 to the Arbor Day Foundation to plant a tree. From Earth Day to Arbor Day, Davey received more than 100 photo submissions. Due to the huge response, Davey decided to instead make a $1,000 donation to the Arbor Day Foundation, Davey said. Davey acquires Elizabeth River Lawn & Landscape in Va.
Davey tags Tom Freeman regional manager for Southern U.S.